Nicole Sperling, the writer of the story, proclaims that women producers have been successful in Hollywood. The list of movies made by women producers is impressive and includes some stars: Kathleen Kennedy, who learned the business while working with Steven Spielberg, was nominated for an Oscar eight times; Megan Ellison finances risky projects, like Zero Dark Thirty and American Hustle; Darla K. Anderson is the highest grossing producer, on average, among both men and women. Proclaiming “success” at this point, however, might be questionable. According to Sperling, although women represent only 18 percent of producers in the Academy of Motion Picture Arts and Sciences, “since 1973, 65 Best Picture nominees have listed at least one woman as a credited producer.” I did the math and that means that 28% of the movies nominated had a woman producer. While this means that the percentage of nominations exceeds the percentage of women in the business, it is still a dismal statistic. And the numbers are even worse for cinematographers, writers, and directors. This makes me wonder. What would happen if women stopped paying for movies unless women were involved in the production of the film? 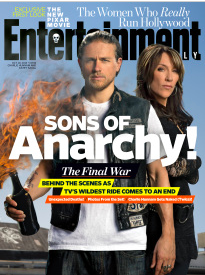 That would make the cover of Entertainment Weekly. Our action could be labeled anarchy and that would indeed deserve an exclamation mark!